Many thanks for all the reviews and photos. for possibel inclusion in Darker Than Blue magazine. "Wembley was magical, but too short. No Airey solo, no Perfect Strangers ... the band just did "the job". 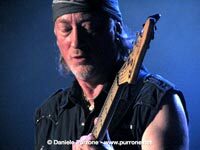 Genova was completely different, one of the best Deep Purple concerts I've ever seen. Ian Gillan's voice was brilliant, he could sing everything without difficulty. Pictures Of Home (including the closing section of the Child In Time guitar solo) / Things I Never Said / Into The Fire / Strange Kind Of Woman / Rapture Of The Deep / Fireball / Wrong Man / Morse solo ~ The Well Dressed Guitar / When A Blind Man Cries / Lazy / The Battle Rages On / Airey solo ~ Perfect Strangers / Space Truckin' / Highway Star / Smoke On The Water / Hush (with Ian Paice solo) / Black Night plus (some 'riff raff 'by Morse). "-The show : grandiose and powerful, almost two hours of happiness - The audience : only 2,500 - The sound : loud and heavy, well mixed with a very percussive bass drum sound and very piercing trebles from the vocals and Hammond. I was facing the right speaker stack, something my ears will remember for a long time... - The lights : less equipment than the previous show last November. Maybe, the stage was not large enough for an entire set-up... - A few good things : the two video screens left and right alongside of the stage with close-ups of the drums and keyboards ; the regional counting song, "en passant par la Lorraine", interpreted by Don Airey during his solo with a wink to the audience ; Paicey's famous one hand roll, always impressive ; and "The Battle Rages On" in the setlist. A few regrets : no songs from "Purpendicular", "Abandon" or "Bananas"
The entire setlist : Pictures of home - Things I never said - Into the fire - Strange kind of woman - Rapture of the deep - Fireball - Steve's solo ~ Well dressed guitar - When a blind man cries - Lazy - Wrong man - The battle rages on - Don's solo ~ Perfect strangers - Space trucking - Highway star - Smoke on the water - Hush ~ Paicey's solo - Roger's solo ~ Black night with a bit of "La Grange"
Click the pics to see full photo galleries from the shows in Zurich on May 11th, and Geneva on May 12th. 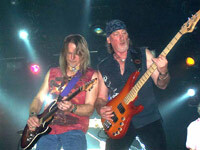 "Deep Purple went on stage at 10.30 sharp to headline the festival. Ian Gillan’s voice never fails to impress me these days, it just seems to get better and better. The best thing about seeing the band live is the fun they have on stage, and to see Ian, Roger and Steve laughing together on stage also makes you feel good. Don Airey played parts of our (the Norwegian) national anthem in his solo spot and also music from our great composer Edward Grieg. This went down particularly well with the 8,000 strong crowd as the show took place on the day before Constitution Day. It was an outdoors event, and the weather was pleasnat if a little cold, but who cares when the band is so hot. The local newspaper “Stavanger Aftenblad” carried the post-show headline “Brilliant Deep Purple” and that what they just were this night... brilliant." The set list: Pictures of Home / Things I Never Said / Into the Fire / Strange Kind of Woman / Rapture of the Deep / Fireball / Wrong Man / Steve Morse solo ~ Well Dressed Guitar / When a Blind Man Cries / Don Airey solo ~ Lazy / The Battle Rages On / Don Airey solo ~ Perfect Strangers / Space Truckin’ / Highway Star / Smoke on the Water. Encore: Hush with Ian Paice solo / Roger Glover solo ~ Black Night." review & photo : Ove Aase. There is a full gallery from the show in the DPAS photo gallery. "Well, it must have been my concert number thirty-something yesterday at the new Lotto Arena in Antwerp, and I have not sent any reviews for quite some time now, but this 'morning after' I feel obliged to do so again. A Deep Purple concert is always good, but I have been critical before since one may expect more than 'good' from a legendary band. Yesterday however, the band delivered a smashing performance. Was it the new concert hall and its perfect sound? Was it the surprise in the set list with an airing of 'The Battle Rages On'? Was it the - rather young - audience that evoked that Friday night feeling? Frankly, I think it was Ian Gillan, who appears to be in top condition. My God, has he lost weight - and he looks sharp as knife. He has been my point of criticism in previous reviews, but I think he is now striving hard at making the best of hwat could be the final years of the band's - career. 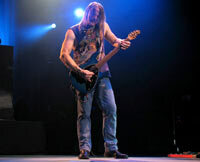 "I have been following Deep Purple since the seventies and I have seen hundreds of gigs. Some bad, some good and some sensational. The Antwerp show must be placed in the top 10. The sound was superb, you could hear every note, even in the front row. Don´s keyboards in particular were much easier to hear than in the past few years. The band were in top condition, had a lot of on stage, and the audience (a 6,500 sell out) reacted fantastically well. They put so much energy into Into The Fire - there were thousands of hands in the air beating at the rhythm. The Battle Rages On was also played extremely well, indeed I have always hoped that the song would be back in the set - it is truly a fantastic live song." Pictures of Home - Things I Have Never Said - Into the Fire - Strange Kind of Woman - Rapture of the Deep - Fireball - Wrong Man - Steve´s Solo ~ The Well Dressed Guitar - When a Blind Man Cries - Lazy - The Battle Rages On - Don´s Solo~- Perfect Strangers - Space Truckin´ - Highway Star - Smoke on the Water - Hush - Black Night. review & photo : Peter Rossen. There is a full gallery from the show in the DPAS photo gallery. "I am not a great festival lover, it always takes so many hours before you get to see your favourite bands. But this festival had only four. The Bintangs (Dutch bluesrock band, raised somewhere in the sixties) kicked off with one hour of really good rock. Next was Talisman with Journey singer Jeff Scott Soto, great singer, good act but the songs were too much of the same to me. Y&T gave a good show with all of their classics. When Deep Purple hit the stage the tent was filled up and even outside it was crowded. About 6,000 people saw them put on a good show. The band were very relaxed on stage, for example when Ian explained to Steve in Strange Kind of Woman how the strange woman looked, and when Don imitated Paicey´s one handed drumming with his own version of one hand keyboard playing during Lazy. 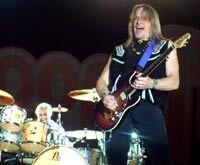 Steve jammed a couple of 'riff-raff' intros with Roger and Paicey before starting into The Well Dressed Guitar. And just like yesterday in Belgium he played like it was his last time. The sound was fantastic, so that makes the soundman the man of the evening! Afterwards at their hotel, Don said that his solo-album is almost ready and that he is very excited about it, and Roger talked about his Corridors project, for which takes pictures of corridors in all the hotels he has stayed! " Pictures of Home - Things I´ve Never Said - Into the Fire - Strange Kind of Woman - Rapture of the Deep - Fireball - The Well Dressed Guitar - When A Blind Man Cries - Lazy - The Battle Rages On - Space Truckin´ - Highway Star - Smoke on the Water - Hush - Black Night. 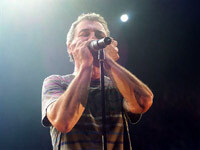 "OK - like so many others I have been reading the tour reviews and they all say how good Ian Gillan is these days. So it was with high expectations that I made the four hour drive to see tonight's show. Uriah Heep supported, and did well, creating a really good vibe. They should have played older stuff early in the set to get people going, but in the end the packed hall (5,500 strong) gave them a standing ovation.